It’s been four and a half years since partners Dan Herbst and Geoff Hardman peddled their first homemade bagel at the Gordon Square Farmer’s Market. Since then the bagel boys have moved production from Herbst’s apartment to Cleveland Culinary Launch and Kitchen to rented space at Ohio City Pasta and finally to their current home, a production facility and retail storefront in Ohio City, which they launched with help from investor Alan Glazen. Next up for Cleveland Bagel Co. (4201 Detroit Ave., 216-600-5652) is an East Side facility that will closely mirror the one-year-old shop in Ohio City. The new production facility and retail shop will assume roughly 2,800 square feet of a massive 140,000-square-foot warehouse on Carnegie Avenue at E. 77th. That facility also is home to Souper Market and Produce Packaging. A dedicated parking lot will make it easy for busy commuters to stop, shop and roll. Herbst says that his best estimate for an opening is late spring or early summer. It’s been three and a half years since partners Dan Herbst and Geoff Hardman peddled their first homemade bagel at the Gordon Square Farmer’s Market — and that bagel truly was homemade, fabricated as it was like all the rest back then at Herbst’s apartment. This past fall the duo opened a production facility and retail storefront with the help of partner Alan Glazen, whom the pair met while filming Cleveland Hustles. 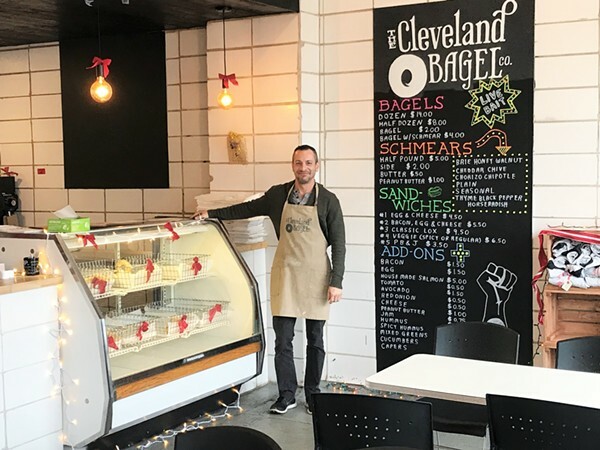 Since the beginning, the goal of Cleveland Bagel Co. has been to produce the best-tasting bagels that money can buy while building a local business that lives up to the “Cleveland” brand. CLEVELAND, Ohio — Barbecue and hot pot made a splash, and the LeBron James-produced television show, “Cleveland Hustles,” gave us new eats. There’s been no shortage of places to explore since we last filled you in on recent additions to the food scene. From fast casual to markets and cafes to upscale dining, the last year has seen the openings of plenty of new options for Cleveland food lovers. And don’t forget the drinks. Hansa Brewery’s long-awaited opening graced Ohio City, Euclid Brewing Company opened its doors and Western Reserve Meadery finally launched its tasting room. Artisan food companies like Old Brooklyn Cheese Company and Cleveland Jam both planted brick-and-mortars. And don’t forget the tacos: Camino, El Taco Macho and Taqueria La Loma all provided new outlets for the craze. Donning the chef’s apron more your style? New markets like Nature’s Oasis, Ohio City Provisions and Ipanema Brazilian Market all let you take the tastes home. 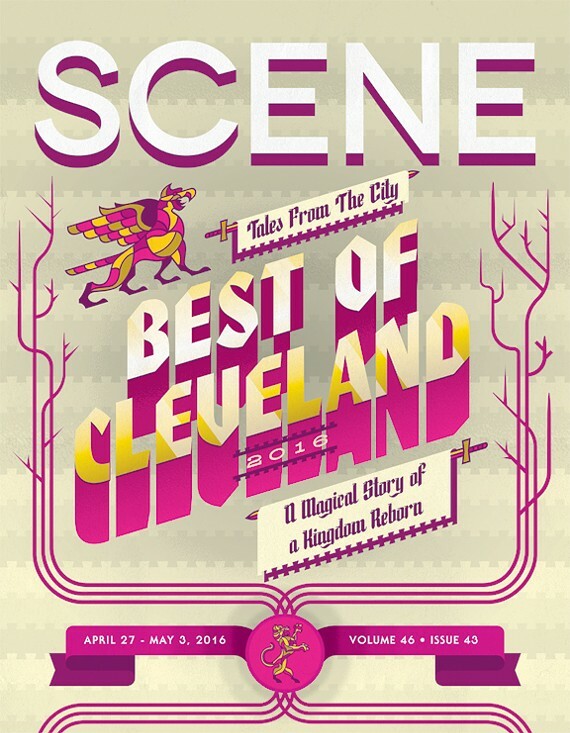 This guide takes you through some of the most exciting recent openings in the greater Cleveland area. Let us know where youare most looking forward to trying out. Death, taxes and the supremacy of New York bagels. There are three certainties in life — or so we thought. On the latest episode of CNBC’s reality business show “Cleveland Hustles,” the owners of the Cleveland Bagel Co. flew out to the Big Apple to debunk everything we’ve ever known about boiled and baked circles of dough. Bonin Bough, host of “Cleveland Hustles,” facilitated a meeting with Chieh Huang, CEO of Boxed, and Elyse Burack, the company’s senior marketing manager. The goal was to impress them in a taste test and secure a national distribution deal with the bulk wholesale shopping company. It would be a massive growth step for Cleveland Bagel. In case you hadn’t noticed, LeBron James is working hard to be more than just the guy who somehow stopped the Golden State Warriors and finally gave Cleveland another pro sports championship. That’s one reason it’s worth paying attention to a new reality television show that James and his partner Maverick Carter have put together starting Wednesday at 10 p.m. ET on CNBC. Called Cleveland Hustles, the first season pairs eight aspiring entrepreneurs with mentors in the business community. They have a chance to open a store in Cleveland’s Gordon Square Arts District and compete for funding from investors, with the idea that they might eventually expand from a local shop to a wider brand. CLEVELAND—New Yorkers are brash champions of their bagels. Montrealers politely insist theirs are best. But there may be a bagel that is better than both in a place that isn’t used to bragging about itself: Cleveland. 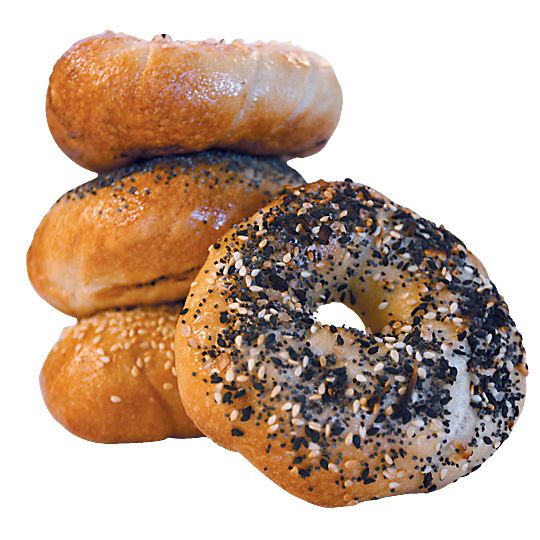 The bagel comes from the kitchen of the Cleveland Bagel Co., which is barely a kitchen at all. It is the backroom of a local pasta shop. That is where 300 dozen bagels are rolled every week by a former warehouse employee and a software executive without any hint of experience. A better bagel begins with a plan. 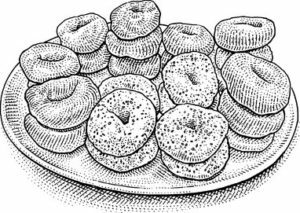 And for the boys behind this popular startup, that plan was to come up with a style of bagel not readily available here, a sort of hybrid between doughy New York-style bagels and the sweet and squiggly ones commonly found in Montreal. After years of trial and error, the result is a truly unique, delicious, Cleveland-style bagel. This is not doughnut-shaped bread, but rather hand-rolled, water-boiled and batch-baked goodness that results in pleasantly chewy bagels with that characteristic slick, shiny skin. The bagels are available at coffee shops and restaurants around town. 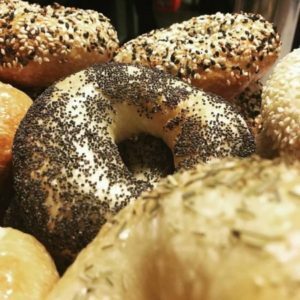 Get yours topped with sea salt, poppy seeds, sesame seeds or a little bit of everything — what folks in the know call mish-mash. Slice, schmear, repeat. 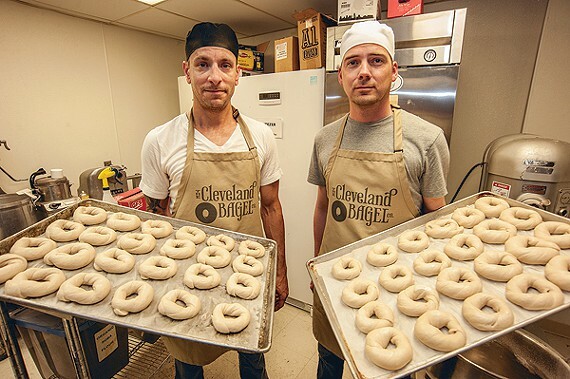 Cleveland Bagel Co. co-owners Geoff Hardman and Dan Herbst are more than just bakers — they are inventors. In 2013, the duo spent countless hours creating a Cleveland-style bagel — a mashup between those you’d find in New York and Montreal. The result is an Old World-style bagel with a crusty ring and a chewy interior. As a warehouse worker, Dan Herbst was no stranger to burning the midnight oil; then, a layoff sidelined him from his routine. That’s when he joked to his longtime friend Geoff Hardman that, “Maybe I’ll just start making bagels.” Hardman, who was constantly searching in vain for locally sourced bagels for business meetings, stopped in his tracks. A few cocktails later, the wheels were set in motion for Cleveland Bagel Co., despite a decided lack of culinary experience between the pair.